DLSS was a feature tested quite heavily in the Final Fantasy XV benchmark since it was the only game based benchmark to support the RTX feature. Final Fantasy XV, particularly its benchmarking tool, has been a source of excitement for several months due to Turing performance leaks and DLSS support. However, Square Enix reports that they have now cancelled all future development for the game and will no longer deliver content they promised, including DLC, and perhaps DLSS support, modding tools, and a Vulkan API implementation. Final Fantasy XV for the PC has garnered plenty of attention lately thanks to Nvidia's new RTX GPUs. 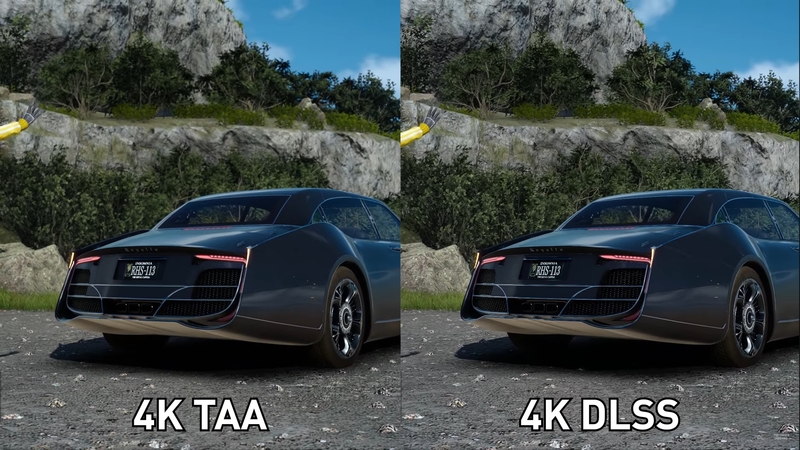 First, RTX scores were leaked on FF XV's online benchmarking tool prior to launch, and then the benchmark (not the actual game) added support for the new RTX technology DLSS. However, Final Fantasy fans and early adopters for Turing will both be disappointed since further development of the title has been cancelled and several gameplay and technical features that were promised may not longer be delivered. This news comes soon after the departure of Hajime Tabata from Square Enix, who was the director for FF XV. The cancellation, for gameplay purposes, means no official modding tools are likely to release and the cancellation of 3 of the 4 DLCs that Square Enix promised to deliver. For technical purposes, this means that there is one fewer game that will support Vulkan and DLSS; to have both would be a first, as each feature is quite rare. The Vulkan API is famous for delivering extremely high framerates on DOOM (which also features the far more inferior OpenGL API) and modestly increasing performance in other titles. DLSS, on the other hand, is a novel way of doing anti aliasing on Nvidia's latest RTX series of GPUs based on the Turing architecture. While only the cancellation of the 3 DLCs is confirmed at the time, the fate of other planned features is uncertain. This is particularly unfortunate for RTX owners, since FF XV was one of just a handful of games promised to support RTX technology, and games such as Battlefield V and Shadow of the Tomb Raider have both released without any of the RTX technology they were promised to support. As for Final Fantasy fans, the team behind FF XV is already working on a new title, which could very well be another entry in the franchise, so at least there may be something to look forward to in the way of a new game.